How are you doing with your exam preparation? I hope you are doing well and practice a lot. despite the fact that this is basically all you need, I”m going to help you a little bit. How? I am sure that today’s post about Clothes and Fashion will save you 30 to 60 min. Instead of going to Google and trying to find relevant sources of vocabulary for this topic, just use materials I gathered together in one place. This means, I’ve done some research for you (I think as time passes I’m getting better and better at it) and found both useful and interesting articles, podcasts and videos about Clothes and Fashion. How other people tell stories related to clothes and fashion. Links to useful materials which you can use to read articles, listen podcasts and watch video about what people wear, types of clothes and styles. 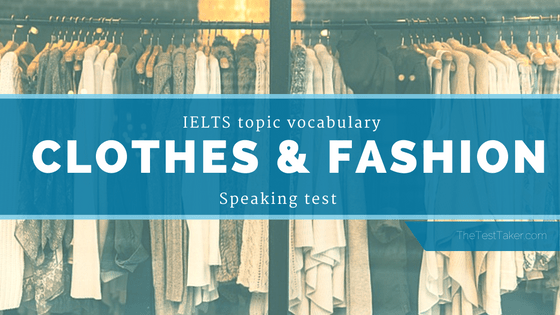 Vocabulary from sub-topics and related areas such as: fashion, dress codes, different kinds of clothes. What kind of clothes do people in your country usually wear? What kind of clothes do you dislike? What kind of clothes do people wear to work in your country? Are clothes expensive in your country? I am a 28 year old female. How do I dress my age? do you like to follow trend? I recommend to check out this article I found on realmenrealstyle.com. I am not sure it’s going to help you to dress better, but I can assure you’ll find dos of great vocabulary related to different types of clothing. What’s more, there are a lot of examples of how you can describe different styles. To tell the truth, I couldn’t find a decent videos about this topic. A almost gave up , because TED.com is not a place where you can find wide variety of talks about fashion. It’s more about technology, scones and people. However, eventually I found a video that I liked. Although it has no a lot of useful vocabulary for this topic It carries some good ideas to think about or discuss. In case you’ve never visited ted.com, there is a great feature called “Interactive Transcript”. As you watch video, you can also see transcript divided into paragraphs with underlined words following video. I believe, It can be very useful for language learners. TED Talk By Cameron Russel: Looks aren’t everything. Believe me, I’m a model. Feel free to leave a comment if you have something to share (interesting articles, podcast episodes or videos). I’ll be updating this article and adding more useful vocabulary related to Fashion, Style and Clothes.